The DX-402 easily meets all my needs for a capable shortwave travel radio. I am a casual “tune around the bands” listener, not a serious Dx’er. At the same time I will not enjoy listening for long if the radio doesn’t have the basics. This one has the basics and more! I consider this a truly great deal as an entry level SSB-enabled shortwave radio. You can have fun with this one. My need? I enjoy having a personal radio along whenever I go on vacation. Not just any radio..it has to receive AM/FM/SW and if possible SSB. A radio just makes me feel connected to the world regardless of what part I happen to be in. Radio has always been a comfort to me. Why leave it at home? I have a couple of poor-performing radios ($15-class … I just couldn’t resist) that almost are not worth packing. They are amusing to experiment with, but not much else. I also have a Sony ICF-2010. It does a great job on every band but it does have one shortcoming; it’s not a travel radio. It is big, heavy, and it would cost too much to replace if I damaged it. So, recently I have been looking for a portable that performs well and packs with ease. I was considering several of the fine radios currently marketed by Sangean , Tecsun and Grundig. Then I was fortunate to read on The SWLing Post a notice about a closeout sale of an older Radio Shack model, the DX-402. This is reportedly an upgraded version of the Sangean ATS-505. The radio may also be called the model 20-629. In any event, at a price of under $30 I could not resist. The “World Band Radio” on the right is a real joy to play with. You never know what is going to happen when you hit a button. It’s a ‘mystery’ radio. 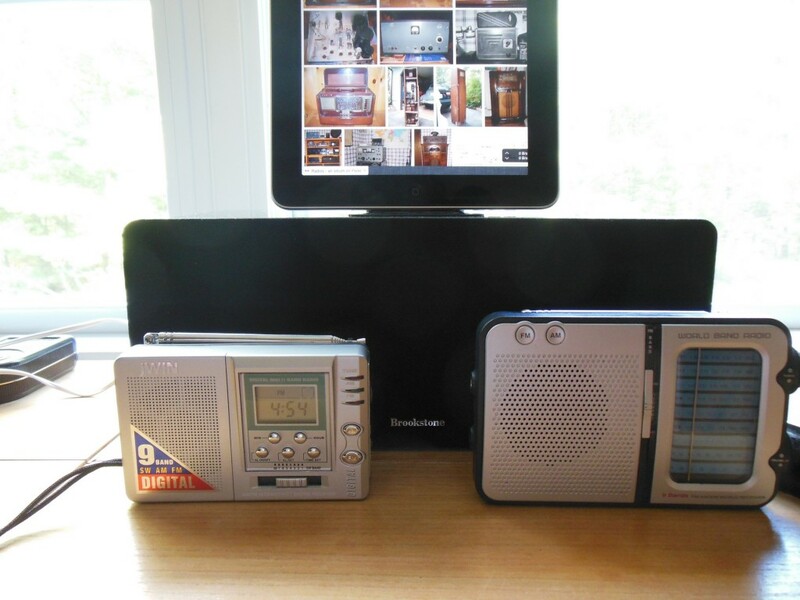 The jwin on the left is an analog radio with a digital display. It’s not all that bad but you need lots of patience to tune in a station (strong signals only). It also pays to hold it at all times to take advantage of the capacitance effect of your body. I love to experiment! Don’t buy these if you actually enjoy listening to radio. I purchased what was described as a ‘used’ radio that was supposed to be in ‘very good’ condition. I received a radio that looked absolutely new. It also performs as new. This unit was probably an overstock. There is no evidence that anyone ever used it. AM Broadcast – It is less sensitive than the GE but it still pulls in the stations. The signals come in noticeably weaker and with more background noise on the Radio Shack. If you live in the city all the stations will come in loud and clear. If you are in the country (my case …. 35 miles from most AM broadcasters) the reception of distant and/or low power stations will be weaker. I live in Rhode Island. All the major RI stations come in well but with background noise. Many much stronger stations from New York come in as well or better. The fidelity is good but it is lacking in bass response. This is best noticed when the Radio Shack is compared to the larger GE which has a 5″ speaker. Also, you must orient the radio properly for good reception (it has an internal ferrite bar antenna) and keep it at least 2 feet away from a LCD monitor or you will get a buzz (no beer required). FM Broadcast – The radio brings them in. Remember, I am at least 35 miles from any metro area. A quick tune across the band (daytime) yielded 24 stations that came in just fine. Of those stations 10 of them were extremely strong signals. At least one , WCIB in Falmouth, MA, was 57 miles away. Others were likely more distant. The sound is good but of course it does not have the fidelity of a big radio. I connected the earphone jack on the DX-402 to my external iPad amplified speaker from Brookstone (another great bargain) and the fidelity improved quite a bit. Speaker size counts. Long Wave – I have not copied anything here. It is not especially sensitive. The Sony usually can copy several local airport beacons but I did not hear them on the Radio Shack. 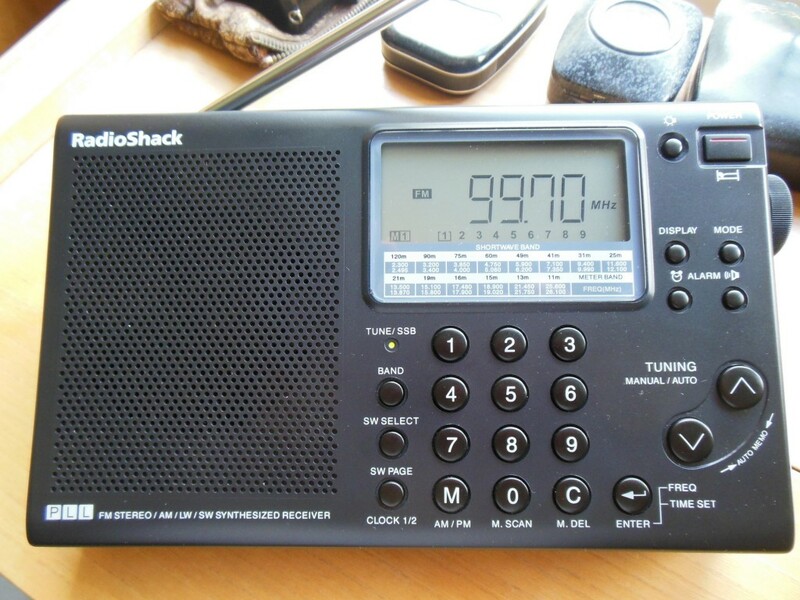 Shortwave AM Broadcast – The DX-402 is less sensitive than the Sony. Some stations that were weak but 100% copy on the Sony were not copied at all on the Radio Shack. Otherwise, all stations that had moderate to strong signals were easy to listen to. The radio did not display any drifting and the signals were right on the correct frequency. This is exactly what I was looking for. Shortwave Single Side Band (SSB) – I was able to copy many moderate to strong signal ham transmissions. Most hams transmit on frequencies such as 14.200 or 14.250, not at odd multiples such as 14.207 or 14.375. Usually if I was right on frequency it was not necessary to adjust the SSB clarify dial. If I did have to adjust it the signal cleared up nicely with little effort. The SSB signals were generally a bit wobbly in tone. They were not of the same quality as on the Sony, but I was able to copy easily so long as they were relatively strong. The ergonomics of the radio are a major strong point. The controls are easy to use and logical. All of the little things have been included. There are two different clocks (I keep one at local time and one at UTC) and they can easily be accessed by a push of the ‘Display’ button. A second press of the ‘Clock 1/2’ button toggles between the two. Memories are more than adequate and easy to save. One real neat feature is the memory list in the main display. Right below the frequency display you will see a series of numbers. If you saved all 9 of the available 9 memories per band (18 for shortwave in two pages) you will see the numbers 1-9. The memory you are tuned to will have brackets around it. How convenient is that? Below the display is a handy list of all shortwave bands and their ranges. Bands are selected by pressing a ‘Band’ button. Then there is ‘Scan’. There is a normal scan (‘scan tuning’) that finds active stations in the current band. Then there is ‘Auto Preset Scanning’ which works on FM, AM (MW), and LW. This scan will find all of the strong stations on the band and save up to 9 of them directly into memory. I tried it on FM and it worked great! There are plenty of other features (3-position tone switch, external antenna jack, DC-in jack, stand, alarm clock, etc.). If you want details I suggest you check out an online PDF of the radio manual. One hint: watch the display when you turn the radio off. It will briefly inform you of the battery condition by showing from 1-9 numbers (9 would indicate strong batteries). I don’t believe this appears in the manual. I learned about it by reading an informative review on Amazon.com. Now if only there was a carry strap… but then I found the well for the stand to be a good secure place to grip the radio. That will do! The Radio Shack PLL FM Stereo/AM/LW Synthesized Receiver is not the ideal Dx radio, but it is exactly what I was looking for in a travel and lunchtime radio (I usually have a radio at hand during lunch and while sitting on the deck in the back yard … It’s summer and the living is easy…). Do yourself a favor and check out the excellent blog authored by Thomas Witherspoon, The SWLing Post. He will let you know where to get bargains like this radio and many others. Note: Clicking on an image will enlarge it. To return, use your <Back> key. If this article was of use to you please consider telling others about it by using the social media links. Also, if you provide your email and click on “Subscribe” (bottom of column to the right) you will be informed by email of new posts. Your email will not be shared with anyone else. Thank you! This entry was posted in Radio: Amateur & Broadcast and tagged 20-629, ATS-505, DX-402, ham, inexpensive, portable, radio, review, sangean, shack, shortwave, SSB. Bookmark the permalink.